Dean Barkley graduated from the University of Minnesota Law School in June of 1976. He was admitted to the Minnesota Bar in September of 1976 and was certified to practice before the Federal Bench in October of 1976. Mr. Barkley has practiced law in Wright County and Hennepin County for over 30 years. 16 years ago he became involved in politics and co-founded the Independence Party of Minnesota. In 1998 he recruited Jesse Ventura to run for Governor for the State of Minnesota and served as the Chairman of his campaign. He served as the Director of Strategic and Long Range Planning for four years under the Ventura Administration. 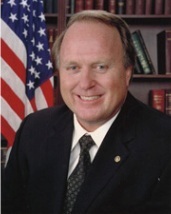 In November of 2001, Governor Ventura appointed Dean Barkley to the United States Senate to serve the remaining term of the late Senator Wellstone. From 2002 until present Dean Barkley was a registered lobbyist in the State of Minnesota . He represented several clients before the Minnesota State Legislature, the Metropolitan Council, The City of Minneapolis and the Minnesota Racing Commission. He is still actively involved in politics having run for the United States Senate in 2008. In addition, Dean Barkley served as a volunteer football coach for the Wayzata football program, he founded the Minnesota Youth Rugby program and was active in St. Phillip the Deacon Lutheran church of Wayzata.